the posh lobby of the Hotel Lafayette downtown. 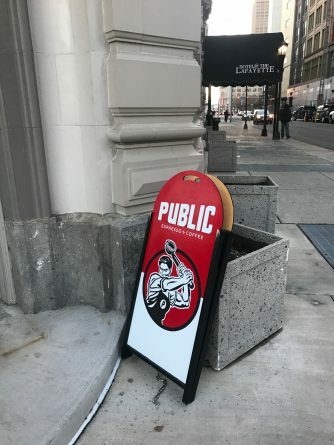 Public plans to offer lunch soon, with small plates, and increase their hours of operation. They are currently open 7 a.m. to 7 p.m. Monday – Friday and 8 a.m. to 7 p.m. on Saturday and Sunday. For more information about Public Espresso + Coffee, please visit www.publicespresso.com.